By and large, children's authors are a friendly bunch. We tend to be nice, and helpful, and whilst we come in various levels of forthrightness there are very few I have ever met and not liked, even when we have been in disagreement. So I hope it will be understood how much it pains me to say that Horrible Histories author Terry Deary has lately been behaving like a great steaming prat. For those of you who may have missed the row, it begins with Sunderland Council, like so many others, considering sweeping cuts to the library service - including closures - in order to save money. According to the Sunderland Echo, "Sunderland-born Terry Deary welcomed the plans". The Echo goes on to quote Deary as saying that libraries "have had their day... The book is old technology and we have to move on, so good luck to the council.” The following day Deary told the BBC that the closures were "long overdue". Not unsurprisingly, a lot of authors got a bit cross about this. Now let me make one thing clear: I fully believe that Deary has the right to express his opinion. But that being so, others have the right to express their opinions of his opinion, and many did. 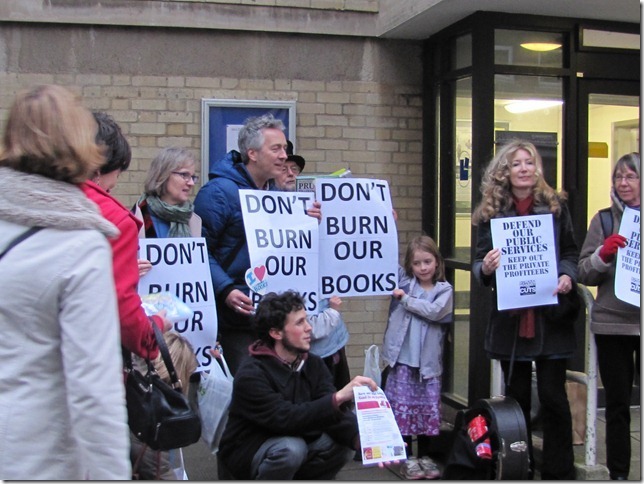 One such has been Alan Gibbons, tireless campaigner for libraries and the importance of the book. You can read Alan's statement here. I think it's pretty measured, all told, and addresses Deary's points, such as they are. Deary's response? He rudely refers to Alan as "that Gibbon bloke", responds to his offer of a public debate with the offensively dismissive "in his dreams", misrepresents his comments, and with enormous irony accuses him of making "offensive personal remarks". I think that what distresses me most about all of this is that Deary seems to think he's being clever and radical, when in fact all he's doing is chucking about unsubstantiated and inflammatory assertions and then getting cross when people rise to the bait. But I get the feeling that this is his modus operandi. Back in October 2011, I happened to hear Deary on Woman's Hour, debating with Susan Greenfield on the subject of traditional books and new technologies. Norwegian researcher Anna Mangan also contributed, citing empirical research that suggested that printed matter supports reading comprehension better than screen technology. Deary's response? He dismissed the research as "quite laughable" and "deeply flawed" and the researcher as "just another Luddite". The clip is worth a listen simply to hear Greenfield challenging Deary on his inconsistencies. "It is for me to challenge the established, failing, unfair, irrelevant established order. It needs to be opened up for public debate,"
"I haven’t the time to expend hot air on a meaningless discussion that would change nothing; nor have I the inclination to discuss a topic that no one really cares about." He also, having made the remarks quoted above, says in another interview "I never attacked libraries," despite, in an interview with The Guardian, claiming "libraries are cutting [authors'] throats and slashing their purses". And this seems to be the nub of the matter. 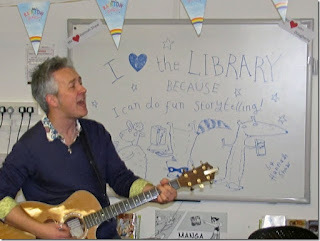 Deary - one of the UK's most-borrowed authors - appears to believe that if libraries didn't exist then every borrowing would translate into a sale, and instead of £6,000 per year PLR, he'd be making an extra £180,000. Well, I can tell you, Terry - speaking as a not enormously high-earning author whose ten-year old reads even more than I do - that that's just not true. If libraries didn't exist, I'd have to read less. And so would my children. And so would all the other children who depend on libraries. Deary is attacking libraries, despite his protestations; and in doing so, whether or not he realises it, he's attacking literacy. And attacking them with arguments which are flimsy at best, and at worst simply unfounded. Deary is already a fierce critic of schools - in one interview suggesting that children "should leave school at 11 and go to work" - and has previously called for schools to be banned from using his books, and there is for me a huge irony in his now adding libraries to his hit-list. Because I very strongly suspect that were it not for all the teachers and librarians who have championed his books, few of us would ever have heard of Terry Deary. Two comments to finish with: firstly, I trust that Mr Deary - should he ever deign to read this post, written as it is by someone he would doubtless dismiss as having a small mind and a small talent - will not accuse me of having called him a great steaming prat. I haven't. I have accused him of lately behaving like one, which is quite different. And secondly: petty of me, perhaps, but I can't help but be amused by this. Since I appear to be one of these authors with a small mind and a small talent, I feel totally justified in suggesting that Terry Deary has a small something else. Thanks! Helena Pielichaty has also blogged about this today. Well put. One of the ironies of all this is that Amazon have just patented the right to re-sell ebooks and earn full share of the profits (see link). One wonders how Terry Deary will take this news. I can't see any difference between that and libraries initially purchasing the books and then loaning them for free. I wonder if he'll offend the ebook community next? I know he's lost his fan base amongst librarians. 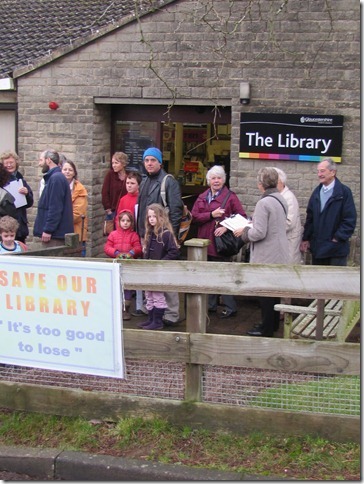 Sigh - when will people realise that libraries are at the very centre of any community? 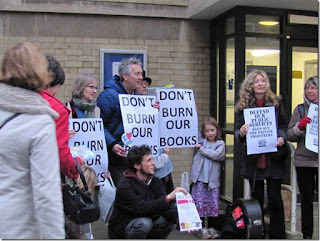 When will they realise that, much as we might want to, none of us can buy every book we want to read? Excellent. And I loved the link at the end.